The Infiniti QX50 concept – the brand’s vision for a next-generation premium crossover – makes its Asia debut this week at Auto Shanghai. Demonstrating how the design of the 2016 QX Sport Inspiration, its conceptual forebear, could be adapted for a future production model, the QX50 Concept is designed to articulate Infiniti’s ‘Powerful Elegance’ design language. A ‘cabin-forward’ silhouette combines with what are described as muscular lines and flowing surfaces to telegraph its purpose as a dynamic and practical crossover. The organic forms of the ‘driver-centric, passenger-minded’ cabin were designed in harmony with the exterior shape. The company says that by blending progressive design with modern craftsmanship, the QX50 Concept’s interior reflects Infiniti’s desire to challenge conventional approaches to premium interior design. Infiniti’s latest concept is also the next step toward the company’s future autonomous drive support technologies. Central to the strategy for the development of all future Infiniti autonomous drive support systems, they ensure the driver retains ultimate control over their vehicle. 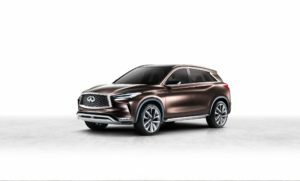 Furthermore, the QX50 Concept illustrates a potential application for Infiniti’s advanced Variable Compression Turbo (VC-Turbo) engine, offering drivers a powertrain that adapts to offer both power and efficiency.